The Rotary Club of Carroll Creek (RCCC) joined Sailing through the Winter Solstice (STTWS) in 2017 and was most happy to continue the journey in 2018 as RCCC celebrates its 25-year anniversary! The idea. RCCC has long been involved in the rejuvenation of Downtown Frederick and participating in STTWS is a natural extension of its mission. Construction. RCCC purchased a simple single-mast 12-foot fiberglass red sailboat on Craig’s List. Through weekly building meetings over the span of four months, its dedicated shipmates transformed it into a two-mast vessel with curved aluminum sails, a shop-grooved PVC deck supported by six laser-dimensioned lateral wooden ribbings, customized PVC railings, a rear cabin, a mid-deck connection “doghouse,” a carved bowsprit, a crow’s nest, 3/8 inch rope lights and a shortened keel to support a 70-pound hanging anchor. 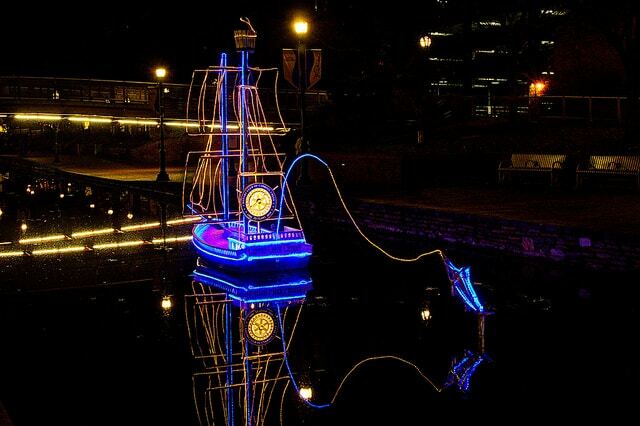 The sailboat proudly displays the blue and gold Rotarian colors as well as the 25-year anniversary wheel! Rotarians rallied behind the project and enthusiastically participated in a naming contest within RCCC. Close to 120 names were suggested, 8 finalists were retained, voting took place and, voilà, the Carroll Creek Clipper was born! A rear sail, a crow in the nest, and a jumping Maryland white marlin hooked to a fishing rod completed the second-year edition. Many thanks to Pete Kremers and Kyle Thomas for their vision and tireless energy in launching STTWS! Started as a one-boat pilot project in2016, the festival now counts ten boats in Carroll Creek and two on land. An absolutely remarkable achievement! Super kudos to my shipmates, with whom I had the great pleasure and honor of working! Bob DeIuliis, for his solid building skills and pragmatic approach! Josh Donofry, our benjamin, for defying gravity in the shop, and jumping into the frigid waters at launch! Doug Fauth, for generously hosting the building meetings in his workshop, and for his extraordinary craftsmanship! Neil Fay, for making sure water pump and electrical connections were operating properly, and stringing endless feet of rope lights! Mark Mayer, for finding our base sailboat, introducing the curved sails concept, and for being our money man! Melissa Muntz, for guiding us through the various media! Tom Plant, for being our anchor man, and for his continued attention throughout the building process! Bonnie and Rob Swanson,for their esthetic flair, and for stringing hundreds of feet of rope lights! The Clipper shipmates are deeply grateful for the precious support of Linda Roth, RCCC President 2017-2018, and of Peter Fitzpatrick, RCCC President 2018-2019. Their strong commitment to the project made it possible and very enjoyable! Our charity. Color on the Creek.